Ghent (Gent or Gand) is a city in Flemish Belgium, located in the northwestern part of Belgium. This historic city was one of the largest and richest cities in northern Europe in the 1300's, around 50,000 people. Today it is a popular tourist destination. Ghent has probably the oldest hotel in Europe, the three-star Best Western Cour Saint Georges Hotel. Almost all hotels, from a design hotel to a medieval castle, in Ghent are in the old town centre or within walking distance. Each hotel meets the quality standards of the Flemish Tourist Accommodation Act. • Four star hotels in Ghent: Sandton Grand Hotel Reylof, Holiday Inn Gent Expo and Ghent Marriott Hotel. • Three star hotels in Ghent: Europahotel, Hotel Astoria Gent, Hotel Carlton, Best Western Hotel Chamade, Holiday Inn Express Gent, Aparthotel Castelnou and Hotel Orion. 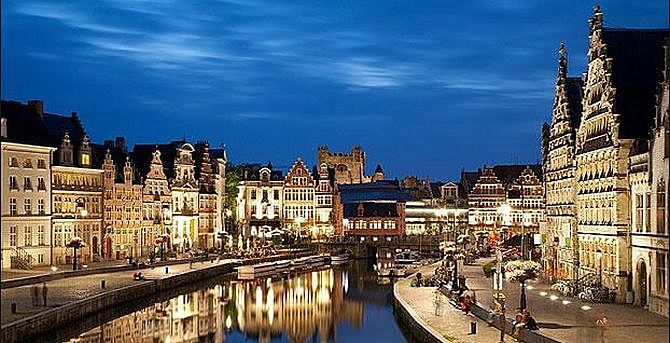 • Hotels, budget hotels, hostels, B&B's, apartment hotels, apartments, pensions and Gasthofs in Ghent: B&B Jan van Ghent, The Hamptons Boutique B&B, Campanile Gent, ZevenVrijeDagen, B&B B³ Boat, The House of Trade and Gent City Center. Some of the hotels in Ghent are: Holiday Inn Gent Expo four star Hotel Harmony four star, four-star NH Gent Belfort, Best Western Residence Cour St Georges three-star Holiday Inn Express Gent three-star Ibis Gent Centrum Opera Two stars. Lonely Planet called Ghent the best kept secret in Europe and National Geographic Traveler magazine called Ghent the most authentic historic city with a busting with life. Check the special offers from your favourite hotel in Ghent and book online. Museums Ghent: MIAT – Museum about industry, labour and textile, MSK – Museum of fine arts, SMAK – City museum for contemporary art, STAM – Ghent city museum, Design museum Gent, The House of Alijn, St Peter's Abbey, Dr. Guislain Museum, The world of Kina: the House, The School of Yesteryear, Museum Arnold Vander Haeghen, The World of Kina: the Garden and Museum for the History of Sciences. InformationStart Internet Concepts, The Netherlands. Premium websites and premium domains.